The crazy growth of social media is like a wildfire that has gradually engulfed the entire world into its aftermath. Every small or big trend on social media very apparently reflects in our everyday life. Such a scenario has compelled digital content marketing companies to tweak their old content marketing strategies in a way to complement the recent statistics and logic of the social media marketing. Crux Creative Solutions Pvt Ltd is a known social media content marketing agency in Gurgaon and Delhi NCR. With a roll of exquisite clients, we cater to a varied assortment of industries. Subsequently, this becomes the reason why we keep social media trends and logistics on our tips. We understand that the ever-demanding social media never lets you rest. A mere skip of knowledge drags you back to the prelude. Hence, with some expert social media strategists onboard we not just work towards crafting exclusive content but exert on methods to lure 100% engagement. Crux believes that any content posted on social media if not promoted strategically will fall into oblivion thereby wasting all your creativity, time and efforts. 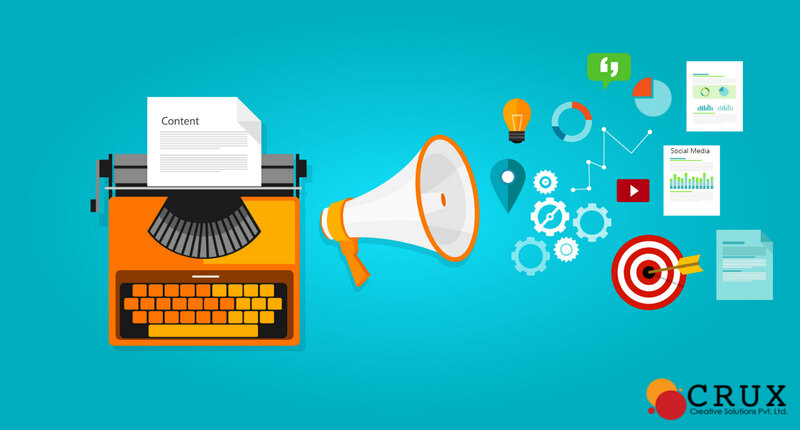 Therefore, we leverage on expounding an intricate content marketing strategy which assists us in furnishing some phenomenal work for our clients. And today, we are spilling the beans on what is that magical social media strategy that makes CRUX one of the top content marketing companies in India. Videos are the new basic! Today from Facebook to Twitter and Instagram, each social media platform is bustling with videos. A proven fact, people are more likely to watch a video than to read a post. It is for this reason that we, a vying Facebook marketing agency, maneuver our social media plans with video-heavy content. Posting anything anytime is not CRUX's style. Not only we stress on maneuvering the perfect content but posting it on an appropriate time covers equally significant part of our consideration. We keep track on when is the maximum of our audience is active, and subsequently, make social media posts at that time to get maximum engagement. Oh yes, telling people to do or not to do something is passe. The current trend is all about having a retrospective approach. People like to tell about themselves, their feelings and their opinions (oh all the time!). Hence, social media posts asking them what do you think? comes out as a winner in attracting engagement. As a creative social media marketing company, we contemplate content on these lines. CRUX is known for providing unrivaled content marketing services in Delhi NCR because of our exclusive working style. While blind promotion of products takes a prominence for others, we go for a more judicious style. In lieu of endorsing our product or service repetitively, we pause to offer useful information to our followers, in the light of our core product or service. It is more of thoughtful strategy budding amongst content marketing companies to offer utility content for better engagement. Hard to believe? Well, you get comparatively more click-throughs when you repost your content. Yes, it's a proven fact that by reposting you can drive more traffic to your content. Therefore, we make it a point to re-post our content, which not only steers more traffic but also saves us from creating a plethora of new content. Smart work, huh? Oh, yes we are. These were the keen strategies that we deploy to bring out some standout work which makes CRUX the best social media agency in India.